With unparalleled experience, AvantGarde Senior Living and Memory Care provides high quality senior care to residents in Studio City, CA. We strive to make senior lives comfortable and meaningful through our caring and compassionate services. Our senior living community focuses on providing personalized care. Whether you are looking for an amazing living arrangement for yourself or a loved one, you won’t be disappointed. Our outstanding senior care solutions are meticulously crafted around the specific needs and situations of our residents. We treat each resident as family and offer one-on-one care and support to them. Our professional staff cares about the individuals they serve. They are fully trained to cater to the varying needs of the elderly and ensure they live with dignity and respect. Rest assured, our staff is always there to help our residents, 7 days a week. We make senior living affordable and convenient. We provide special monthly deals to meet seniors’ financial requirements. Our packages start at $2,500. We also try to make the payment process as simple as possible. We accept cash, debit and credit card payments and insurance. 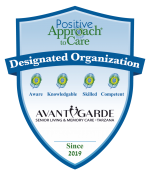 If you would like to know more about the senior care services at AvantGarde, feel free to contact us. We’re here to resolve all your queries. Our senior care solutions are backed by kindness and respect. Schedule a tour or call at (818) 881-0055 to learn more.